Mirchi Macaw and Robber Treaty Escape is another point & click escape game developed by MirchiGames. 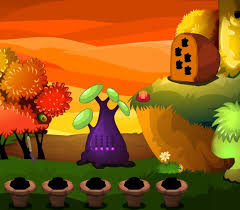 In this game, you are going to find a treasure hidden in the garden. But only the macaw knows where the treasure is. So you must help the macaw to find its mate to get the treasure. You have to find the clues to solve puzzles. Click on the objects to interact with and solve those puzzles to escape. Good luck and have fun! Yeah, not bothering with this crappy #wheel. Leave this kind of puzzle out please. Ruins the whole game. "You have to find the clues to solve puzzles." It told you what to do right at the start. The enjoyment is solving the puzzles. Maybe some people should take up knitting ... I had no problems.